It didn't take long for Colin Lorimer to delve deeper into Irish mythology with his new series from Image Comics, 'The Hunt.' The first issue hinted at Orla's tortured childhood and ended with an assault on her grandmother. Issue two picks up from there and things only get darker. Haunted by evil spirits that only she can see, Orla reaches her breaking point as her grandmother lays clinging to life in a hospital bed. It's time to revisit the Otherworld where the Sluagh lay but escape its confines to steal the souls of the dying in our world. It's there that some shocking revelations come to light and broadens the scope of the terror and danger that Orla and possibly her family find themselves in. Lorimer draws a slow burn with deliberate pacing until the horror is revealed. It's at times part dark fantasy and part suspense thriller and all riveting. With a mixture of flashbacks and supernatural world-building, 'The Hunt' quickly takes us down the rabbit hole while still adding depth to the characters. In two issues, we get an introduction of dark forces and what those dark forces are. It's not a long drawn out reveal but there's still plenty of mystery left intact. Lorimer does the penciling and inking as well as the script. His mastering of shadows and light, anguished expressions, and pacing remind me of Michael Lark and Sean Phillips. From the urban landscape to the land of dark fairies, Lorimer is capable of realistic detail and fantastical imagination. Joana Lafuente's colors, especially in the Otherworld's blues and blacks, gives the pages the distinctive look for the present, the past, and another dimension. Lorimer's use of Irish mythology gives 'The Hunt' a unique set of mystical rules to follow. 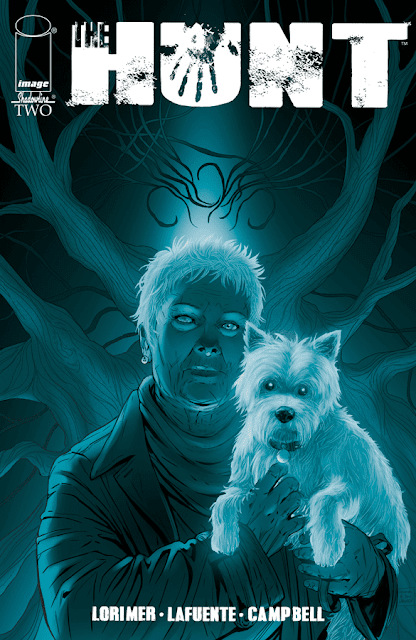 It becomes more intriguing with every issue and the worst is yet to come for young Orla. The story is gaining momentum and I can't wait to see what happens next.